According to this email, you can score a free Topricin Pain, Foot or Sports Cream 3/4 oz sample for following the instructions below! Like their Facebook or Instagram page here. 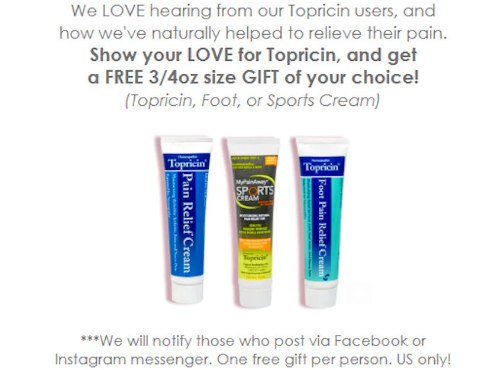 Share a post or story about why you love Topricin before 2/28 and they will direct message you for your mailing information to give your your free Topricin, Foot or Sports Cream sample! * They will notify those who post via Facebook or Instagram messenger. One free gift per person. US only!